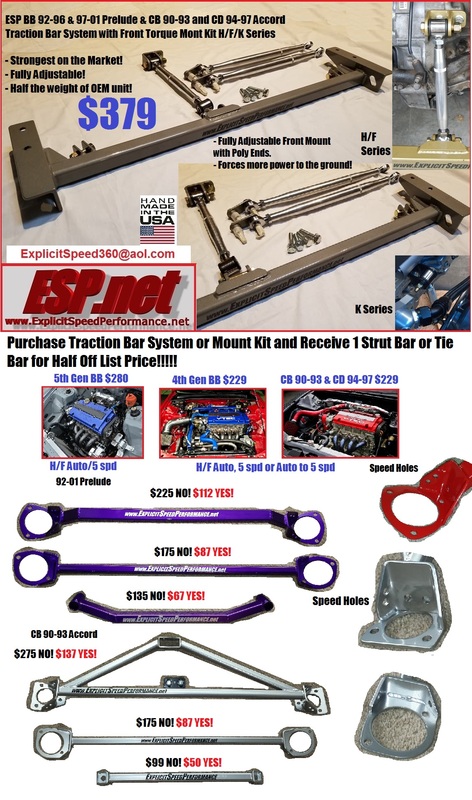 --- ESP SPRING Combo Sale --- ESP CB 90-93 and CD 94-97 Accord Traction Bar System with Front Torque Mount Kit F/H + 90-93 or 94-97 Accord 5 spd Motor Mount Kit F/H and Rear T Bracket is only $40 additional!!! Huge Savings! Strongest on the Market! Hand made in the USA! 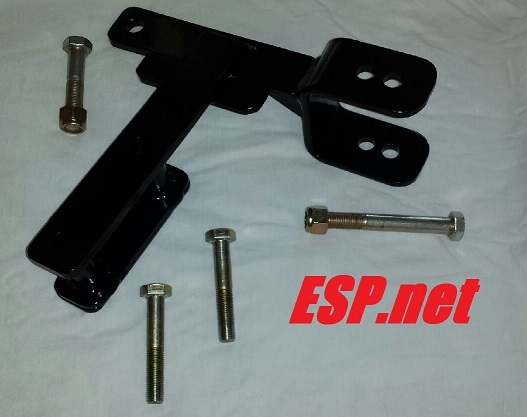 - ESP Rear T Bracket F/H discounted from $155 Shipped US down to ONLYYYY $40 additional! 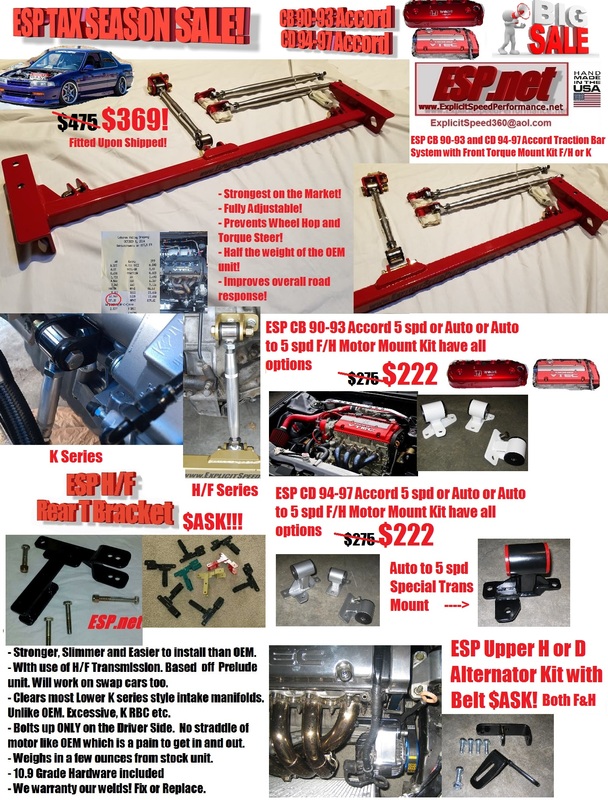 Huge Savings when purchase Mount Kit + Traction Bar System! Or Just ASK!!! OR $80 Additional when just purchasing Mount Kit or Traction Bar System! All products come standard semi gloss black powder coating with Red decal or choice of color decal. For a little additional we have 150 other powder coating colors to choose from. Many Candy Colors and Textured Colors. All Products are hand made and made upon purchase. They are not mass produced. Our products are the strongest on the market and best fitting. Rest-A-Sure when you purchase from us you will receive the best quality product available. Mount Kits come with Black 70A Polyurethane insert color. Mount Kits and Traction Bar Systems are 6-8 weeks and Strut Bars and Tie Bars are 8-10 weeks. However should be a little sooner. Hand Made and Made in the USA! Wait time is 8-10 weeks. May be a little sooner. I am doing them on my personal time for past few years. These are very time consuming pieces. Each one is hand crafted from scratch. They will come standard semi gloss black powder coating with a Red decal. Or choice of color decal. 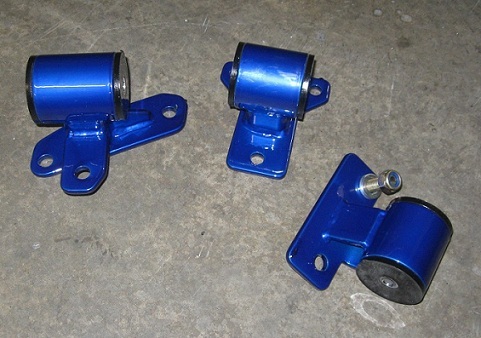 Or for a little additional can have any custom powder coating color. Check with me on Price. 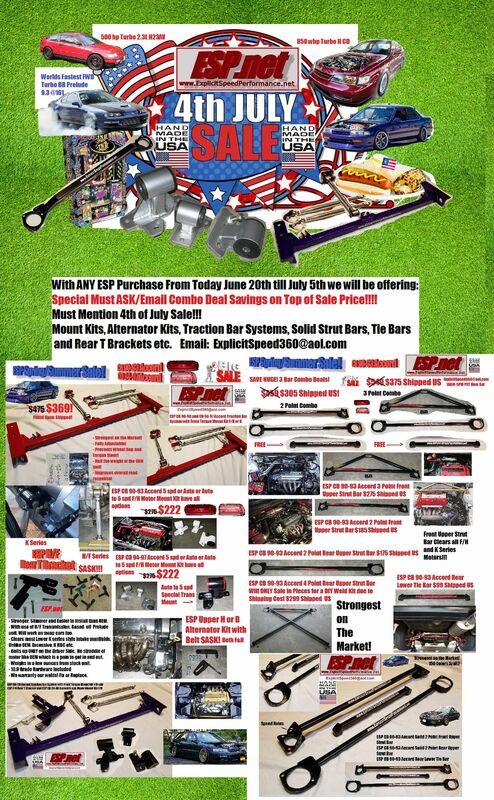 Our ESP Solid Strut Bars are the Strongest on the Market! That is a guarantee! Message on here or Email me if interested. - ESP 2 Point Rear Lower Tie Bar FREEEEE!!! List is $459 Shipped US. Combo Deal Special Price $305 Shipped US! - ESP 2 Point Rear Lower Tie Bar FREEEE!!! List is $549 Shipped US. Combo Deal Special Price $375 Shipped US! - Comes with hardware and bracket to attatch 3rd point to firewall will envole drilling 3 holes and mounting bracket on inside of cowl. 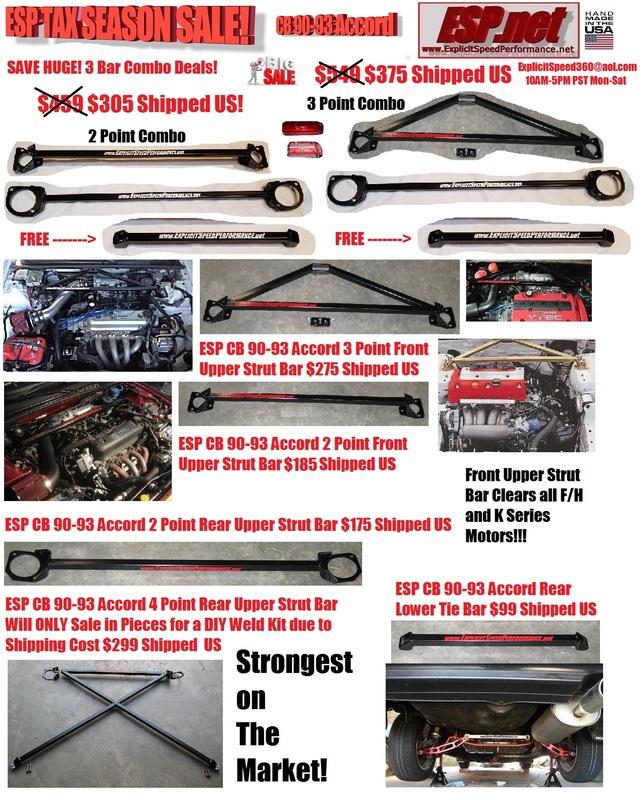 ESP 4 Point Rear Upper Strut Bar Because of Huge Box and Cost to Ship I will only do the 4 Point Raw and Unwelded. $300 Shipped US. Let's talk about these 2 things here. Instead of your Nose of car going up and loss of Traction immediately and going to one side of the road with the OEM unit. Our ESP unit will keep the nose of the car down, grab Traction much quicker in RPM and go straight instead of off to one side. It will keep the engine movement to a minimum and force more power to the ground. It will also help aid the longevity of the Mounts. It will help with the added Traction. Will also aid those with higher hp cars. Our ESP unit is a much stronger than the OEM unit. You can jack on the main bar in the middle or the end plates. It is best to use a 2x4 piece of wood maybe a foot long and a rag to protect the powder coating. Our ESP unit being much more quicker in control will overall improve all steering and handeling of the car in good and bad weather conditions. The adjustability of our unit is much easier and quicker than the OEM unit. Simply unlock the jam nuts, rotate the bar in and out to get within spec. Then lock down jam nuts and done. - Road Race guys swear by our unit. They are able to run more power/boost with the added Traction around corners. Equates to quicker times. - Our welds are SS ARC welded. That is the best penetrating weld for thicker steel. Our ESP unit is a Win Win. Our ESP units are HandMade and Made in the USA!!! They are all Made upon purchase. We do not skimp or rush our quality. There is a wait time. Our Hand crafted SS ARC welds are nice and thick. ARC weld is the best penetrating weld! We DO NOT skimp and use robotic tig which is a thin out weld for mass production and lot of times is too thin and will not penetrate as well. Other cheaper units wont last as long and parts are not as strong. Some you can't even jack on them. We use best hardware and Heims available. We don't care if they cost more. We want the Best! Some of the Fastest Cars run our Units. The Worlds Fastest Turbo BB Prelude, Worlds Fastest All Motor BB Prelude, Worlds Fastest Nitrous BB Prelude... all run our ESP units. We also have 900 hp H22 Turbo 4 door Accord and a H22 Turbo Accord currently running a 10.94. We ESP have been around for some time over 12+++ years. We are the Original Production Traction Bar System Company for the Prelude and Accord Chassis. Roger's Fastest FWD Turbo Prelude was one of the first. He came to use when was running low 11's. He was trying to go after the Worlds Fastest Prelude Claim at the time which was high 10's at the time. We made him a Traction Bar System and he was able to get the Claim and continue to improve the car to a blazing 9.33 1/4 mile time. Our Current Halloween Sale for the ESP Prelude/Accord Traction Bar System with Front Torque Mount Kit H/F is $399+$26 for shipping. Paypal Payment. Please Email Me with any other questions or wanting to purchase. Hello, fellow enthusiasts. Just wanted to take a quick moment and say we at ESP Explicit Speed Perf. www.ExplicitSpeedPerformance.net appreciates all your support and business. Keep supporting the Companies that support your chassis! I wanted to also take a quick moment and explain what some of your first modifications should be. As Always we feel your first modifications should always be to establish a good firm foundation. Honda/Acura OEM rubber mounts with time and age tear. Front and Rear are usually the first to go. 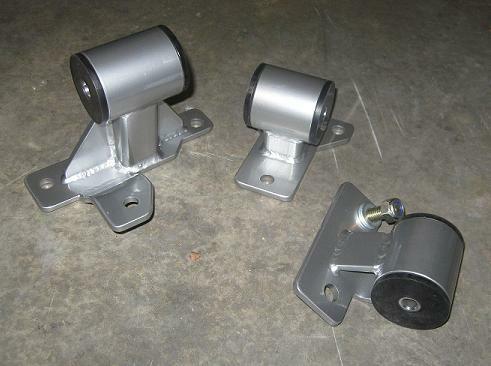 We recommend our ESP Polyurethane Motor Mount Kit as a replacement of all mounts. The come with 70A polyurethane inserts. We feel 60 is too soft and 80/90 is too hard with a lot of vibration/race only. Thus we use the happy medium 70A which usually covers just about everyone upwards of 600++ whp. Then our ESP Traction Bar System Front Torque Mount Kit will aid after that. Our Mount Kit will help get more power to the ground instead of lost in the rubber OEM mushy mounts. We feel your next modification should be continuing on with the chassis foundation. Our ESP Traction Bar System with Front Torque Mount Kit will prevent wheel hop, torque steer and keep the nose of the car down thus forcing more power to the ground. The Front Torque Mount Kit will aid in preventing unwanted engine movement and will force even more power to the ground. Along with our ESP Motor Mount Kit goes hand in hand. Our Traction Bar System will also strengthen the front end and also improve overall road response in good and bad weather conditions. It’s a Win Win. The next modification we feel should be Solid Strut Bars. They will deliver the most function of keeping the chassis ridged. 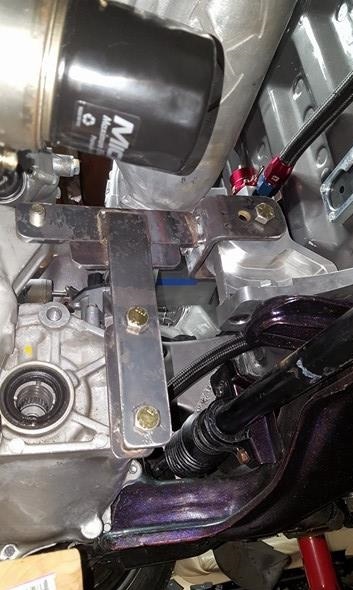 Cheaper heim/hinge Strut Bars will flex at the joint and not delivering complete stiffness to the shock tower. Our ESP Tie Bars will also do the same thing for the Front and Rear. Will keep the cross members firm with much less to none flex. Last edited by ESP-net; 06-22-2018 at 03:26 PM. Up Email for quickest! Always willing to work out a Combo Deal! Save! Current Half Off List! Deal is below. Good til Jan 1st! Huge Sales Right Now! Low Prices Combo Deals! Email: ExplicitSpeed360@aol.com Always willing to work out Combo Deals! 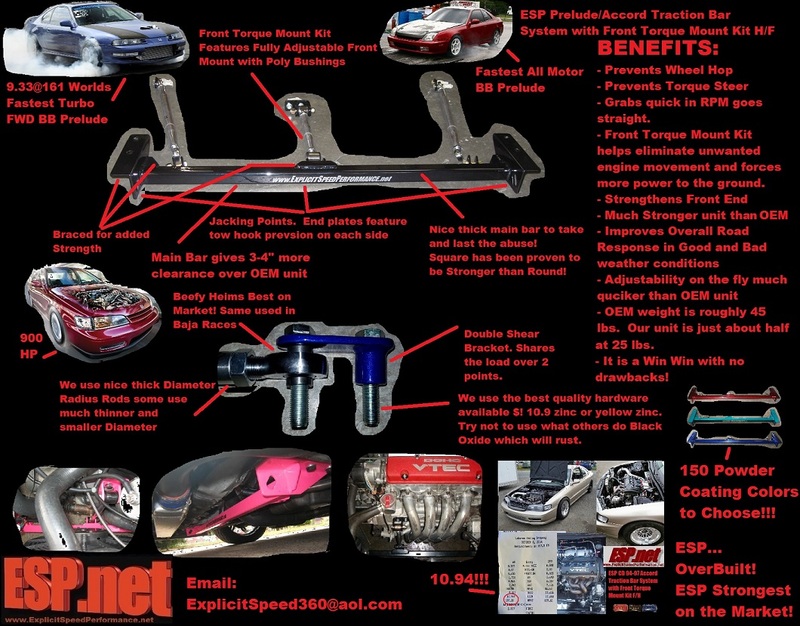 Current Sale Pricing Email: ExplicitSpeed360@aol.com Limited Time!